Kempton Park Racecourse was the setting for this year’s Pro Driver Live, an event aimed specifically at the private hire and chauffeur market. Irish minibus builders EVM, took the opportunity to showcase their new Mercedes-Benz Sprinter based, ‘8 seat X-Clusive’ at the show. EVM has recognised an opening in the market for luxury, spacious vehicles that can be driven without a PSV licence. It has been operating in this market for a number of years and Pro Driver Live provided the ideal opportunity to showcase its brand new vehicle that has been built to a client’s specification. Build of the 8 seat X-Clusive was completed the previous Saturday lunchtime, where it made the ferry that afternoon ready for the exhibition on the Monday and Tuesday at the race course in Sunbury on Thames. The model was described as ‘Executive VIP’ specification and upon entering, you can see why. The steps were highlighted by white LED lights imbedded within the chrome outer edge, contrasting perfectly with the black rubber matting on the treads and the black carpet throughout, which was specified on this model. Left: The monochrome palette of the interior is striking. Right: The table configuration. The configuration is four tables with seats facing each other, two sets on either side of the vehicle. Each table ‘set’ has a double 13 amp socket and twin USB ports which are powered by a 1500 watt inverter. Overhead are individual passenger service units with adjustable air conditioning controls, provided by an Eberspacher system, speakers and LED reading lights. The tables are wall mounted, thereby alleviating leg room taken up by a pedestal. In this instance they were leather topped with a gloss black rounded edge and have two sunken chrome cup holders to one side. EVM have opted for Brusa VIP seating in this model. These were trimmed in real leather with quilted back and seat and Mercedes-Benz branding to the head rest which folds in to support the head in much the same way as airline seating. Behind this is a plastic handle, offering assistance when alighting and embarking and also houses a coat hook. They are reclinable, although movement is slightly restricted due to their positioning and are fitted with adjustable arm rests and three point safety belts. They were incredibly comfortable, enabled plenty of legroom (although no one was sitting opposite me) and the stylish, contrasting white piping added to the overall luxurious appeal. This was further enhanced by the floor to ceiling carpeting that gave an instant feeling of warmth. Passengers can enjoy in-house visual entertainment delivered by two, flip down, inwardly facing monitors, situated at the front and rear of the vehicle. Wi-Fi, Freeview and a DVD player are also fitted together with a music and PA system. On the driver’s side, housed between the backs of the chairs at neighbouring tables, is one of two Waeco slide drawer fridges. The second is situated between the two rear seats and is leather covered, making a useful additional table. Left: The Panoramic roof allows natural light to flood the saloon area whilst the sliding sunscreen (right) offers protection from direct sunlight. The boot is accessed by a door in coach back incorporating gas lift up struts. A fixed shelf is installed approximately half way up the boot space although a fold up version can be specified if preferred. EVM’s drop boot solution offers 2.8 m3 of storage space. In addition two luggage racks run the length of the passenger area. Additional storage can be found behind some and under most of the seats. The 8 seat X-Clusive has plenty of luggage space accessible through a lift up door in the coach back. There is a fixed shelf to maximise use of space. This 8 seat X-Clusive is based on an extra long wheelbase, Sprinter 516 chassis. Alternatively, a 519 chassis can be specified. It comes with a 7 speed G Tronic automatic gearbox and 2.2l Mercedes Benz 163bhp Euro 6 diesel engine. It has the EVM X-Clusive body kit and chrome pack including Alcoa alloy wheels. Safety features include ABS, ESP, ASR, and Brake Assist. All of EVM’s UK chassis come with three years unlimited mileage, Mercedes Benz UK chassis warranty as standard; however, the company has recently introduced a five year extended warranty. Potential buyers can expect to pay around the £80k mark for a vehicle with as high a specification as this. Peter Flynn, Sales and Marketing Manager for EVM, commented that the interested parties hadn’t batted an eyelid! Because EVM do all their own steelwork, fabrication, painting and so forth in house, the lead time, specification dependant, is between six and eight weeks, although this is based on current off peak production. This was EVM’s first time exhibiting at Pro Driver Live and they were encouraged by Chris Brown, MD of vehicle insurance specialists Ethos, to attend and Peter commented that he was pleased overall with the level of interest. The entrance and step arrangement. Three vehicles in total were available to view. White’s coaches of St Albans supplied a medium wheelbase, 3 series 3.5 tonne ‘Trend’, on a Sprinter 316 chassis with 2.2l diesel engine. This more traditional model had 10 seats and features included: leather seating, drop down tables and storage pockets fitted to seat backs, USB port at each row, Waeco cool box, air conditioning and automated entry step. Completing the line up was Eagle Cars’ luxury specification 13 seat X-Clusive, based on the Sprinter 516 Cdi extra-long chassis. The leather seats were in an unusual black and mustard trim with the cab also having the two-tone trim. The floor was covered in a wood effect, non slip surface and the seats had 13 amp sockets but no USB. 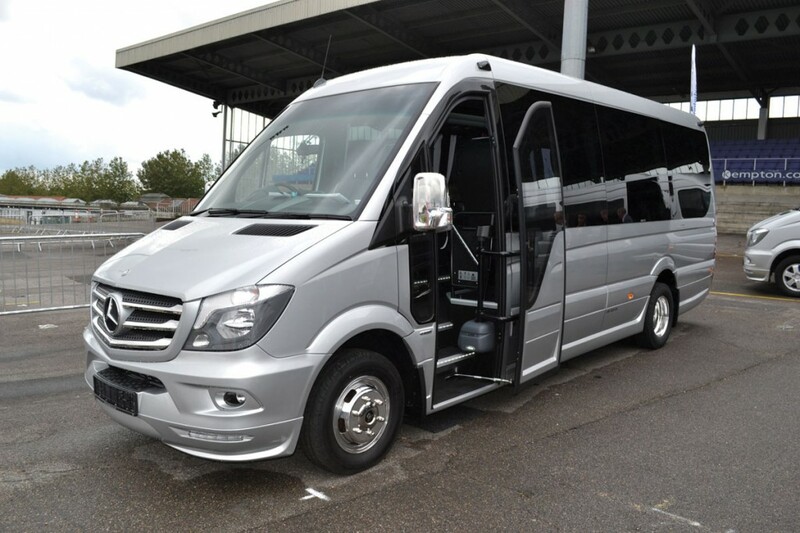 The 8 seat X-Clusive, along with other new and improved Mercedes-Benz Sprinter based products will be on the EVM stand, F10 at Coach and Bus Live.